From Amazon.com: "Most historical theology texts follow Christian beliefs chronologically, discussing notable doctrinal developments for all areas of theology according to their historical appearance. And while this may be good history, it can make for confusing theology, with the classic theological loci scattered throughout various time periods, movements, and controversies. 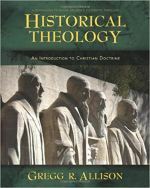 In Historical Theology, Gregg Allison offers students the opportunity to study the historical development of theology according to a topical-chronological arrangement, setting out the history of Christian doctrine one theological element at a time." If you purchase from one of our Amazon.com links, we receive a small commission that helps support this site and does not cost you any extra. Founded by popular evangelist Charles E. Fuller (and named for his father) and pastor Harold Ockenga. Fuller originally wanted the school to be a training ground for missionaries and evangelists. Ockenga encouraged him to broaden his vision for the school, hoping to train pastors as well. The school's theological focus would be to provide an intellectual rigorous and socially aware alternative to the Protestant Fundamentalism of the 1920s. To this day, Fuller's focus is broadly evangelical, claiming students from both conservative and liberal evangelical views. Originally based in Pasadena, CA, the seminary has grown to offer extension campuses throughout not only California but other states as well. Fuller is also one of the largest seminaries in the world, with regular enrollment at well over 4,000 students. The seminary is divided into three closely-aligned schools: The School of Theology, the School of Psychology, and the School of Intercultural Studies. 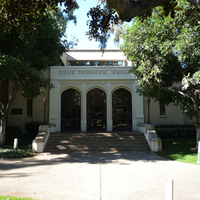 Fuller Theological Seminary's academic life is broad and rich due to the variety of programs offered by the three schools. The School of Theology (the oldest of the three) offers several master's-level programs, including the MDiv, MAT (Master of Arts in Theology), MATM (MA in Theology and Ministry) and MACL (Master of Arts in Christian Leadership). Advanced degrees offered include the DMin, the ThM in Theology, and PhD in Theology. The School of Psychology offers several master's-level degrees as well, including the MA in Family Studies and MS in Marital and Family Therapy. Doctoral-level degrees offered by the School of Psychology include the PsyD and PhD, both in Clinical Psychology. The School of Intercultural Studies offers the MA in either Intercultural Studies or Global Leadership (a Korean language option is available for the former). Advanced degrees include the ThM and PhD, both in Intercultural Studies. A Doctor of Ministry with an emphasis in Global Missions is available, as is a Doctor of Missiology. All three schools offer a wide range of non-degree programs as well as online options (the MAICS, MATM, and MAGL - MA degrees in Intercultural Studies, Theology and Ministry, and Global Leadership, respectively). There are also several Centers and Institutes associated with Fuller, from the Berry Center for Lifelong Learning to the Thrive Center for Human Development. Students at the Fuller Seminary Pasadena campus will find no shortage of activities either on campus or off. From local museums to hiking to, yes, the ocean, there's no shortage of activities in this southern California city. Fuller also offers its students many campus-centered services, including pastoral counseling, vocational assistance, writing assistance, as well as grocery items to low-income students. Health insurance is also available through Fuller if required. In addition to the numerous activities available in the immediate area, Fuller also offers numerous student groups for people with shared interests or from certain demographics who want to fellowship with one another. Fuller offers several year-round apartments to both single and married students as well as "Intentional Communities" where students live cooperatively in houses or apartments. Fuller housing is competitively priced, especially given the high cost of living in Pasadena. However, Fuller Seminary housing is not guaranteed, given the number of students enrolled. The seminary does provide assistance in finding off-campus housing as well as roommates. Fuller has generous financial aid available to students dependent upon their campus as well as the specific program in which they are enrolled. The seminary also participates in Federal Direct Loan and Work-Study programs. Did you attend or are you attending this school? Please help future students by sharing your experiences, pro and con. Thanks! Sharing your school experience is easy to do. Just type!